Step 3: Practice what you’ve learned in these videos for a week. Then continue on with your own practice. We also would love for you to join us if you haven’t already on the Meditation Medicine Study Group on Facebook where we can support each other’s practice through online discussions, sharing relevant posts, and asking questions to the teacher. 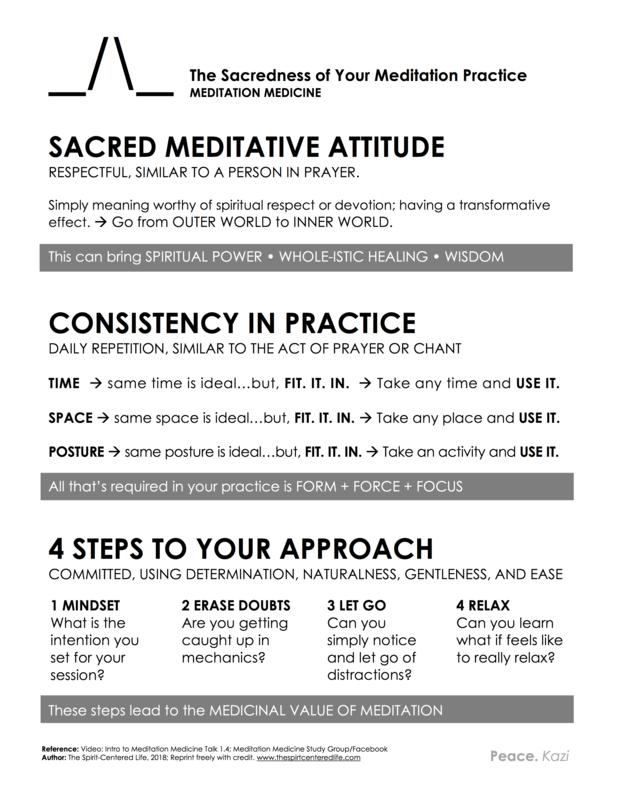 Additional Resource: Infographic 1.4: A Consistent Sacred Meditation Practice. This entry was posted in Ancestral Domain, Ancestral Meditation Medicine, Body Scan Meditation, Breath Meditation, Meditation, Meditation Medicine, mindfulness, Online Study Group, Spirituality, Uncategorized and tagged #breathmeditation, #kazi, #meditation, #newarknj, ancestraldomain, ancestralmeditationmedicine, bodyscanmeditation, meditationmedicine, meditationmedicinestudygroup, mindbodyspirit. Bookmark the permalink.